If you are struggling to lose weight or have had gained weight for no apparent reason, you aren’t alone. This is the most common complaint I hear from my patients with PCOS. It can be so frustrating to try diet after diet, along with exercise, and get minimal results while you see others around you losing weight on the same program! And the advice given to you by your doctor to “just eat less” is totally useless. The truth of matter is that there are REAL reasons why it’s more difficult to lose weight with PCOS. But the good news is that the majority of women with PCOS are able to lose weight. 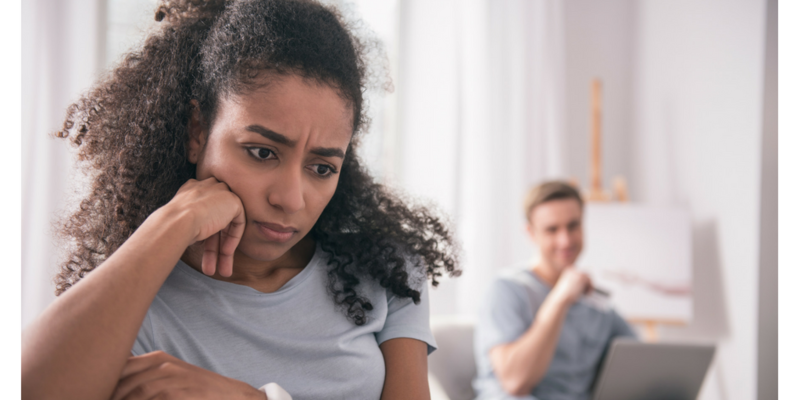 It might take a little detective work to find out what works best for you. Here are some tips that have helped some of my patients. 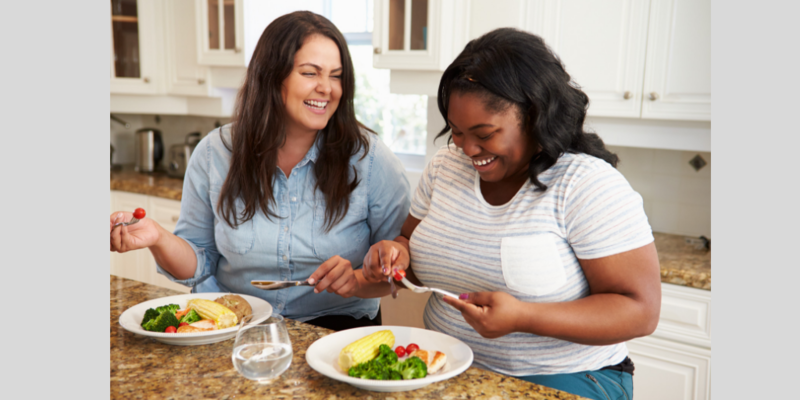 There are several reasons as to why it can be more difficult to lose weight with PCOS including the fat storing effects of insulin, a lower metabolic rate, more carb cravings, altered appetite hormones and more. Read my previous blog post on this topic. Since weight loss is such a HUGE topic that I could break down into 100 blog posts, I just want to give an overview of some tips that have helped my patients. By no means, I am trying to make it seem like I have all the answers, or that “just follow my tips and you’ll lose weight”. It’s so much more complicated. But I’m hoping that you can grab a few tips from my blog post that will help you on your journey. But keep in mind, that weight loss diets need to be tailored to the individual woman. And each of my tips is only touching the surface area! 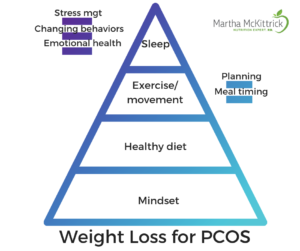 There are 7 different areas to focus on when trying to lose weight with PCOS … and they’re all important. It’s common to get caught up in just the diet part – like cutting carbs – or trying the newest “flavor of the month” diet. But here’s the thing – if you don’t set up the framework, NO DIET WILL WORK. If you don’t have the right mindset and stress management techniques, it can be just about impossible to lose weight and keep it off. The same goes for adequate sleep, meal planning and a good support system. Because it’s so common to get caught up with the diet component, these other areas often get neglected. 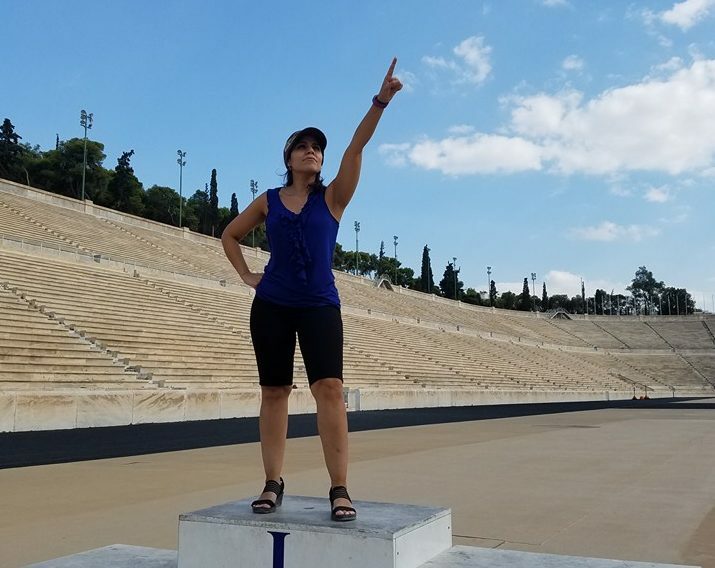 Word of warning: before you read my post, I want to warn you that this post isn’t about giving you a “diet” and meal plan, it’s more about giving you tips for the big picture. Stay off the diet rollercoaster. It’s so tempting to follow a diet that promises rapid weight loss. But diets only work short term if they work at all. Then what? You go back to your old habits because diets are not sustainable. The weight comes back on and maybe even more. And you beat yourself up for not having the willpower to stick to the plan. Not a very healthy cycle! In addition, women with PCOS have higher rates of eating disorders. Trying to follow unrealistic diets only increases the chances that your eating may become disordered. Now if you really want to try a “diet” short term to gain some momentum, then go for it. But then you’ll need to find a more realistic plan you can stick with. Tune out those internet myths that ALL women with PCOS need to avoid gluten, soy, dairy, carbs, etc. Maybe some women feel better avoiding certain foods, but it doesn’t mean you HAVE to. Starting out feeling like you need to restrict all these foods will only cause deprivation. If you are curious, omit a food for a few weeks to see if you feel better. If notice a difference, you may be best limiting that food. But if you don’t notice a difference, forget about that “restriction”! And for the record, I don’t recommend omitting all carbs. Don’t compare yourself to others. This is so easy to do considering our obsession with social media. It’s in our faces! So if Instagram Jenna has PCOS and lost 20 pounds in a month on keto, why can’t you? First of all, rapid weight loss tends to be mainly water. And the quicker it goes off, the quicker it usually comes on. And more important, just because it worked for her, doesn’t mean it’s the best plan for you. If you love steel cut oats for breakfast, an apple for a snack and DON’T want to have your veggies swimming in oil, keto probably won’t work for you! Break free from the all or nothing way of thinking. 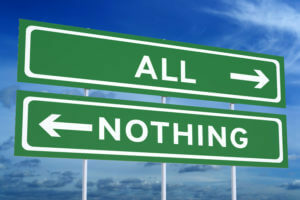 All or nothing thinking is common in people trying to lose weight. It is especially common if you have PCOS because you’ve probably been told that MANY foods are off limits (and most of this info is inaccurate!) So once you enter into forbidden territory and eat … gasp … a potato …. you feel that you might as well eat everything in sight because you went off the DIET. It will be important that you learn to live in the grey zone versus all or nothing. Become more mindful. 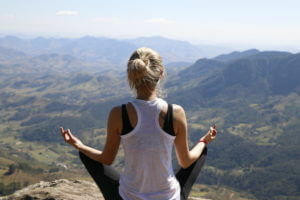 Mindfulness is the buzzword these days for good reason! Most of us live hectic lives and don’t pay attention to what we eat, how we feel when we eat, why we eat, etc. Take a step back and slow down. (see #11 on journaling). Being more in tune with your body can help you pay more attention to your hunger cues. Change your mindset. So many of us have rules in our head when it comes to eating and exercise. Once you break the rule, all bets are off. Try to change your mindset. Instead of saying “I’m not allowed to eat bread” you may want to say “my body feels better when I don’t eat white bread. I’m choosing to have some fruit instead.” BTW- I’m not against bread for PCOS. While I’d recommend whole grain over white, if you had a slice of white bread, it won’t do any permanent damage! Don’t beat yourself up if you stray from your intended plan. This is big one as we can be so hard on ourselves.You may want to analyze what happened and learn from it. Did you get a poor nights sleep the day before so your willpower was down? Maybe you went too long without eating? Or maybe you were just human! Practice body kindness, let it go and move on. Keep a journal. This may be the most important thing you can do to get started on your weight loss journey. Many people keep food logs via an app. But I’m actually a fan of keeping a journal on good old paper and pen because it lets you collect a lot more data. Include the time you eat, what you eat/drink, how much sleep you got, your degree of hunger before eating and satiety after, when you get cravings and very importantly, how food makes you feel. 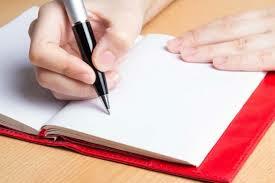 Analyze your journal. Once you’ve kept the log for a week or two, put your detective cap on and analyze your data. Does going too long in between meals set you up for eating too much at your next meal? Does a poor nights sleep increase hunger the next day? Does eating a higher protein/fat breakfast hold you longer than a higher carb one? Does you eat more when you with certain people? Then come up with a plan. Plan ahead for problem situations and come up with a plan. Most people who are “successful losers/maintainers” practice say this is key. Potential problem: Maybe your coworker has candy on her desk that tempts you. Plan: bring in your own healthy snack to help you avoid the candy. Or offer to refill her candy jar with a candy you don’t like. Potential problem: You’re going out with friends to a Mexican restaurant. Plan: Try looking at the menu ahead of time to decide what to order. Have a snack before you go so you aren’t starving. Bottom line, you need to come up with a plan! Plan out meals for the week. Many women say this is one of the most important things they can do to help with weight loss. Take some time on a weekend and write out meal ideas and grocery list. Find some healthy tasty recipes on Pinterest or Instagram or just google “low calorie low carb chicken recipes”. Meal prep. Once you’ve planned your meals, meal prep to get ready for the week. Roast a pan of veggies, grill up a few chicken breasts, and cook a batch of quinoa so you’ll quick meals ready for the week. You can even freeze your own “frozen dinners” for those busy nights. Have a back-up plan for busy nights. We all have busy days when there is no time to cook dinner or you ran out of the food you cooked on the weekend. Come up with a back up plan. Maybe you can make a quick omelet with frozen veggies. Or have a healthy frozen dinner on hand (like Luvo) or find a local take out place that has healthy options. Slim your environment by getting as many trigger foods out of your home or office as possible. Buy a flavor of ice cream you don’t love for your husband or mini bags of nuts if portion control is an issue. Stock up on healthy snacks. Pay attention to how the scale works for you. To weigh or not to weigh … that is the question! I leave this one up to you. If you find the scale frustrates you or causes decreased motivation and self esteem – then avoid it. Some women prefer to go by how their clothes fit or measurements vs the scale. But on the other hand, some women find the scale a helpful tool to keep them on track. 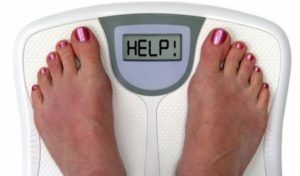 Studies have shown that 75% of successful weight loss maintainers weigh themselves at least once a week. This may help to catch weight gains before it escalates and allow you to make behavior changes to prevent additional weight gain. Study But this does not mean YOU need to weigh yourself. Include adequate protein at meals, especially breakfast. 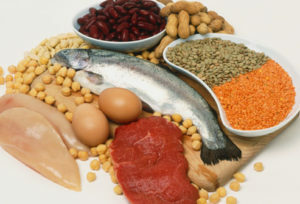 Protein keeps you feeling full longer, and can help prevent those dreaded carb cravings later on in the day. It also helps to prevent/slow the loss of muscle mass that often occurs with cutting down on calories. Don’t be fat phobic. Fat helps to slow the rise and fall of blood sugar. It also keeps you feeling full longer and does not cause insulin to be secreted. This is important as most women with PCOS tend to be insulin resistant. However be careful with your portions of fat as it’s high in calories. 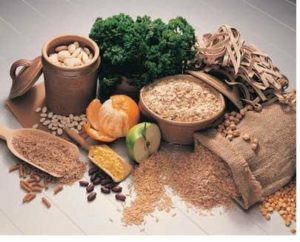 Choose lower glycemic carbs like veggies, legumes/beans, fruit including berries, apples, pears, and whole grains like steel cut oats, quinoa, faro, whole grain bread, etc. Limit sugary, “white” or highly processed carbs as they cause more insulin to be secreted, increasing hunger, fat storage and inflammation. Watch your calories. I know some experts recommend not counting calories. I agree that food quality is just as important as food quantity. So you may find you start to lose weight just by switching to healthier carbs. But if you made these changes and feel your diet is quite healthy, AND you’re still not losing weight, you may want to take a closer look at your calories. Try tracking what you eat on an app for a few weeks. I like myfitnesspal. The goal is not to make you obsessed with what you are eating, but to make you more aware of your intake. Since every women is an individual, it’s difficult to give a calories goal. Most of my patients are able to lose weight on 1400-1500 calories. Some women can go higher, even up to 1700 calories whereas others need 1200 calories. But beware of eating too few calories as this can actually slow your metabolism. How many carbs should you eat a day? I often get asked this question by my patients with PCOS. It is really difficult to give one answer. I’d say most women don’t have to count carbs. As mentioned above, start out by cutting out sugary drinks and snacks and choosing more whole grains versus “white” or refined. Then start cutting back on portions of carbs and eating more veggies. 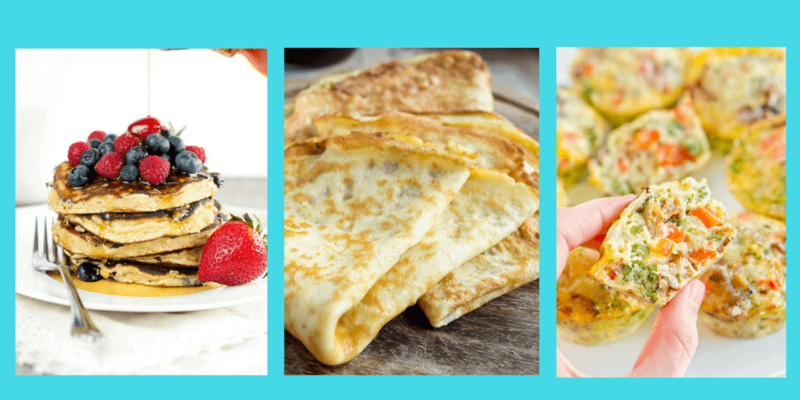 But if you still want an answer to this question – check out this detailed blog post on How Many Carbs Should You Eat a Day with PCOS. Get a baseline of your steps. Use your phone or an activity tracker. If they’re on the low side (under 5000), then start to increase them slowly. Not only does increased movement help to speed the metabolism, but it can improve insulin sensitivity. Add in weight training. This is an area many women tend to neglect. But it’s so important because muscles help get glucose into the cells to use for energy. This helps to improve insulin sensitivity. In addition, muscles burn more calories than fat. And more muscle equals a faster metabolism. Ideally weight train 2-3 times a week. Find activities that are fun. You should look forward to it, not dread it! Try a zumba class or go for a hike with your family if you’re not a gym person. Make it social. Instead of always meeting friends for dinner or drinks, meet for a power walk or yoga class. The ideal exercise program would include a cardio (swimming, bike, elliptical machine, etc) and strength training component. Also not a bad idea to thrown in some yoga! More is not better. 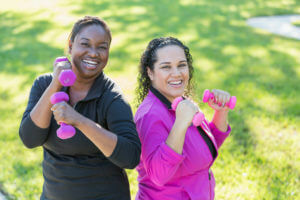 Moderate exercise has numerous health benefits for women with PCOS including decreased insulin resistance, lowered blood sugar, cholesterol and blood pressure, improved gut microbiome, stress management, improved emotional health and weight loss. But excessive exercise can elevate stress hormones – not what a women with PCOS wants. In addition, it can have a negative impact on the immune system, increase fatigue, appetite and risk of injury. But on the other hand, assuming you don’t have any medical contraindications, you want to push yourself enough to see results. Don’t “outeat” your workout! I see many women wearing fitness trackers take back the extra calories they burned working out. So for example, if your calorie goal is 1500 and you supposedly burned 500 in your spin class, I would not suggest eating those extra 500 calories if you want to lose weight. Fitness trackers are also notoriously wrong when it comes to calculating calories in exercise. In addition, since you want to lose weight, there should have a calorie deficit. Now if you were going on a 4 hour bike ride or day long hike, you might need some extra calories! Find ways to alleviate stress. Not only can stress worsen symptoms of PCOS, but it can lead to weight gain and other health risks. I’m a huge fan of mediation. Try a mediation app. Find alternate ways to soothe yourself. Many of us eat for emotional reasons or to soothe ourselves. I’m not saying you should never eat for emotional reasons, just find alternate ways to soothe yourself. Maybe it’s taking a bath, listening to music, watching your favorite tv show or even taking a nap! Come up with tactics to deal with emotional eating. 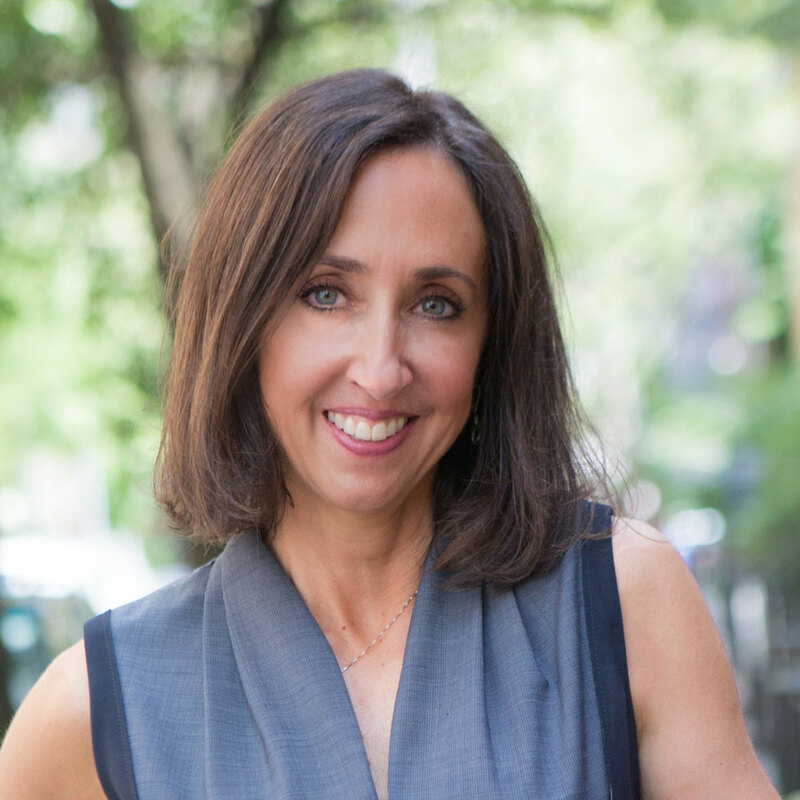 Read some helpful tips by Dr. Gretchen Kubacky including have a plan, slow down, ground yourself, stop avoiding emotions and keep a food/mood journal. Consider meeting with a therapist. Use smaller plates and bowls. Sounds silly – but it really works! Substitute more veggies for carbs. Instead of one cup of rice, have ½ cup of rice and ½ cup (or more!) of cauliflower rice. Or ½ cup real pasta and 1 cup zucchini noodles. No one wants to see a teeny portion of food on your plate. Adding in more veggies will also trick your brain into thinking you have more food and keep you feeling full longer. And you’ll get more nutrients. Eat slower. You’ve heard this one a million times, but slowing down your rate of eating can really make you feel fuller quicker and ultimately eat less. Eat more of your calories earlier in the day. 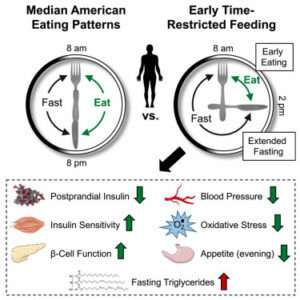 This eating this day is more in tune with our natural biological clock called circadian rhythms. This is especially important for women with PCOS who are insulin resistant. Eating carbs later in evening can have more of an impact in insulin levels as compared to earlier in the day. Find strategies to deal with night time snacking. Many of us are “good” during the day but the night time brings out the food demons? There are several reasons and possible solutions for this. Check out my blog post on strategies to deal with night time snacking. Glad you liked it Ella! Unfortunately you found out the hard what excessive exercise can do. You’ll get there … slow and steady like you said!